Best State Meet Ever for MSJE! 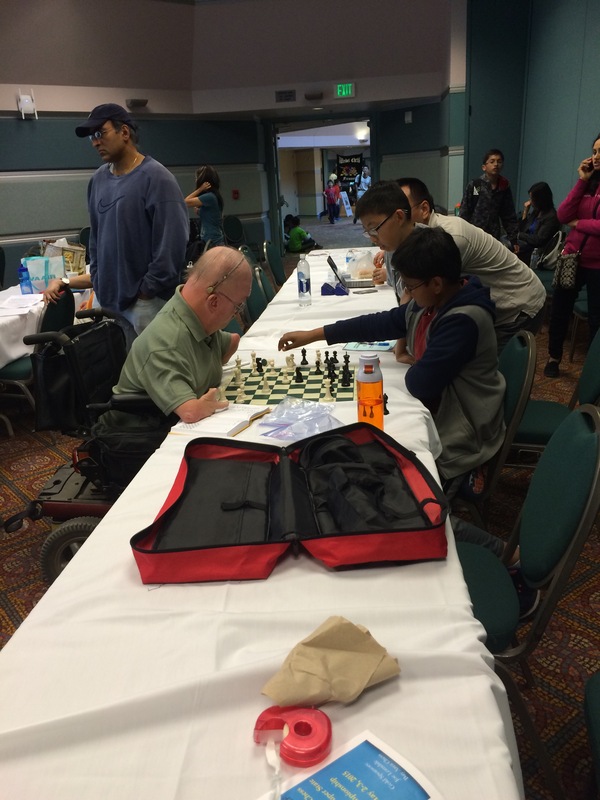 The 2016 Northern California Scholastic Chess Championships were held the weekend of March 19th and 20th at the Santa Clara convention center. Over 900 students and more the 50 schools competed in these championships. 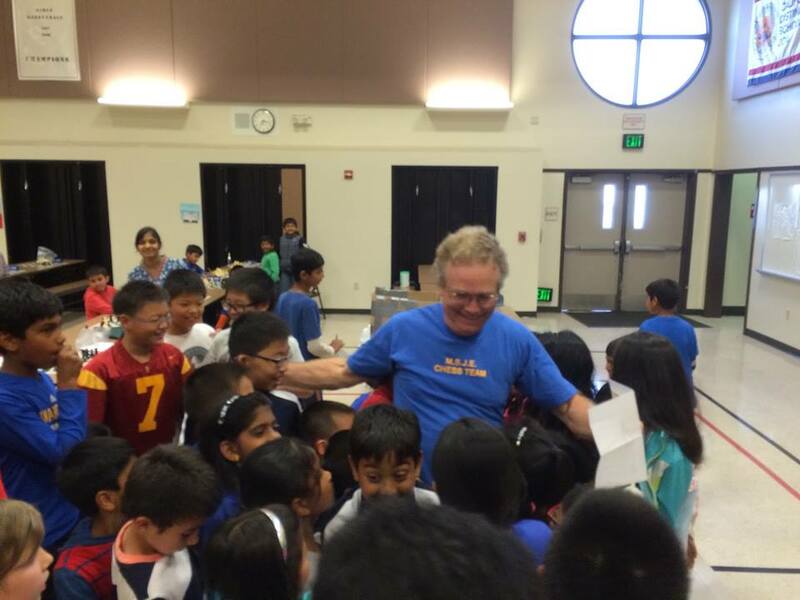 Mission San Jose Elementary school (MSJE) of Fremont was the big winner in the Elementary School Division. MSJE won the team title and MSJE students won the individual Championships in all four elementary school sections! 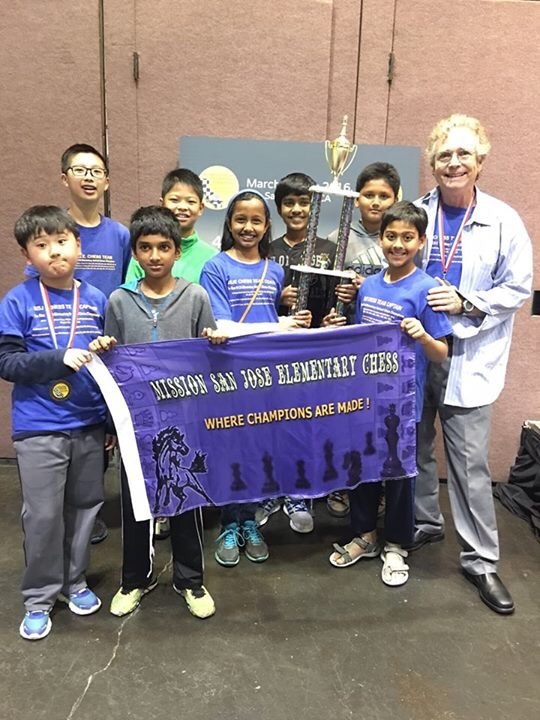 This was the fifth time in the last five years that MSJE has won the team title in K-3, K-5, and K-6, the major elementary school Championship sections. The Kindergarten section individual section was won Jason Liu. Kavya Meiyappan won the third place Kindergarten trophy. Our Kindergarten team won the first place team trophy by a large margin. The K-3 individual winner was Aghila Nachiappan. Allyson Wong won the second place trophy. Our K-3 Championship team won first place by a large margin. Kevin Pan won the first place individual trophy in K-5. The K-5 team won the first place team trophy. Jaisuraj Kaleeswaran won the first place individual trophy in K-6, Rishith Susarla tied for third place and won a large trophy. 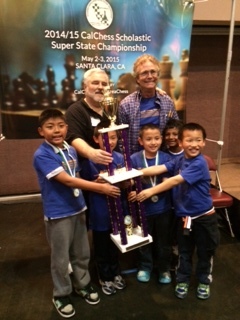 Our K-6 team won the first place team trophy making it a clean sweep of the championship section for MSJE. 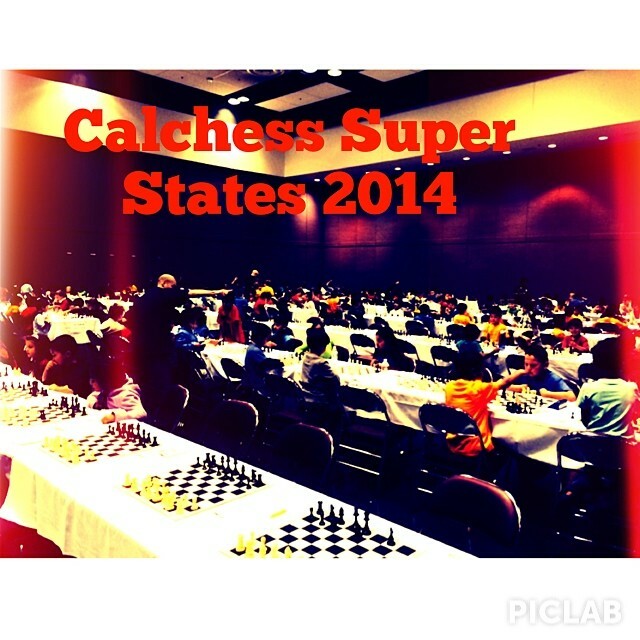 Congratulation to all MSJE chess players. This is the first time in 41 years that any elementary school has done a clean sweep (individual and team championships) of all these championship sections. 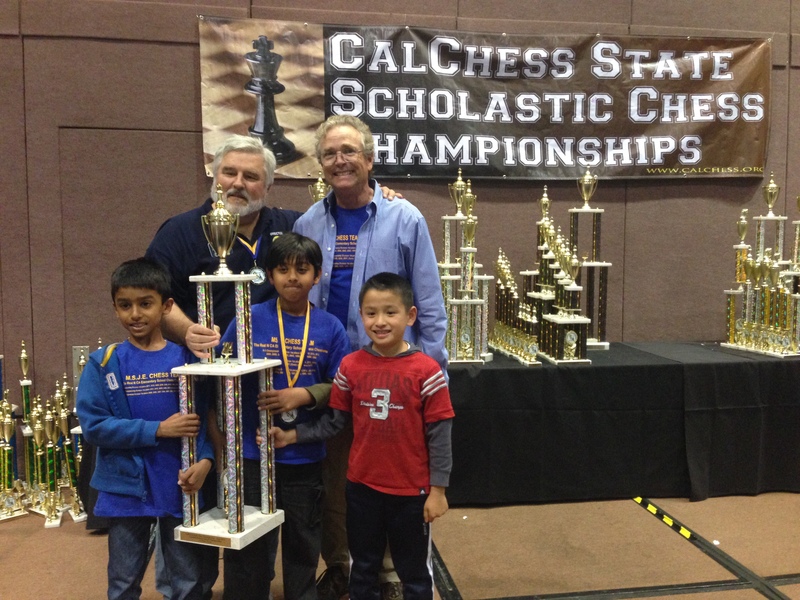 Coach Joe’s report on Mission San Jose Elementary School’s championship performance at the Calchess Scholastic State Championship. Coach Joe celebrating with his students. 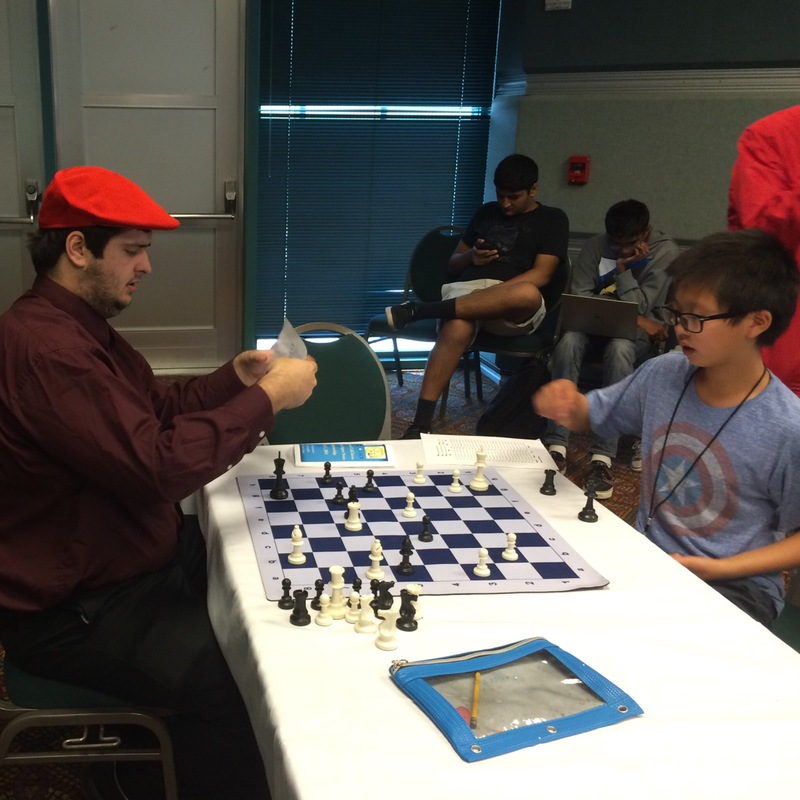 The 2015 Northern California Scholastic Chess Championships were held the weekend of April 26th and 27th at the Santa Clara convention center. Over 900 students and more the 50 schools competed in these championships. Mission San Jose Elementary school (MSJE) of Fremont was the big winner in the Elementary School Division. MSJE swept all of the Championships sections and won several of the Junior varsity sections and rookie sections. The top elementary school section at these championships is the 4-6 Championship Division. For the first time in four years this section was competitive with Weibel close behind MSJE right up to the last round. With one round to go MSJE was ahead by a full point. 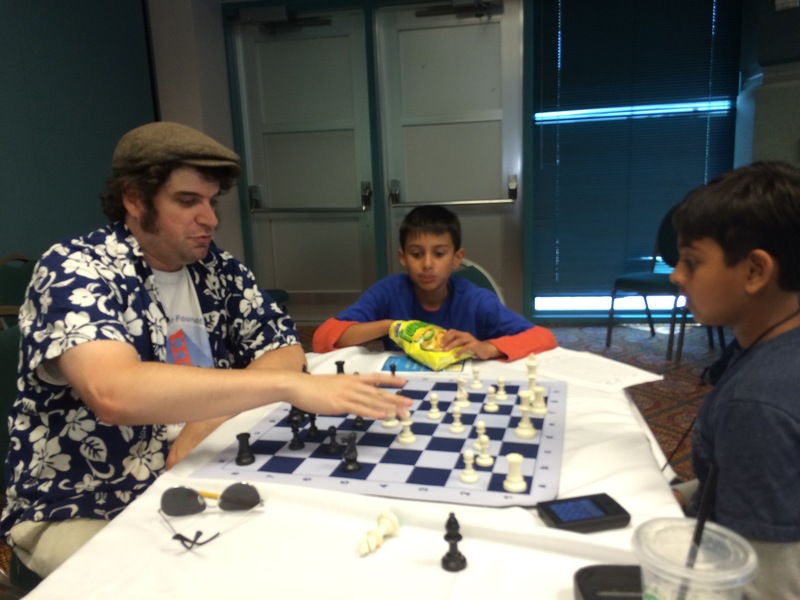 However, the second highest rated player on the MSJE team, Annapoorni Meiyappan, had to miss the last round due to a commitment to a dance program (Annapoorni excels at dance and chess.) MSJE scored 1.5 points in the last round and Weibel scored two points. This left MSJE in first place by the smallest possible margin, a half point. The key to the victory was a draw by MSJE star Connor Chen (rated 1239) against Jeremy Chen (rated 1424) of Weibel. If Connor had lost this game, Weibel would have won the championship. The top scorers for MSJE were David Pan and Annapoorni Meiyappan (with 4.5 points), Connor Chen (with 4 points) and Mihir Bhuptani with 3.5 points. 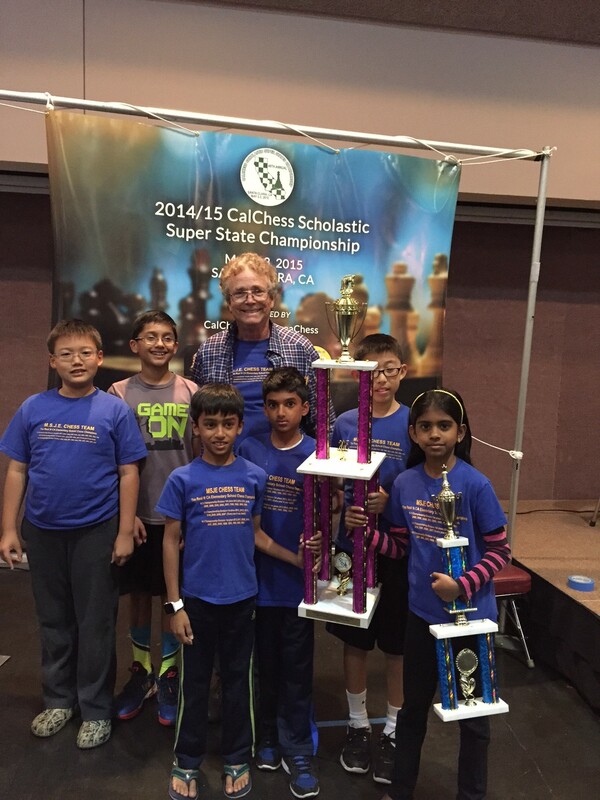 Abhinav Raghavendra, Amulya Harish, Luke Zhao, and Sriram Bharadwaj also competed for the MSJE K-6 Championship team. 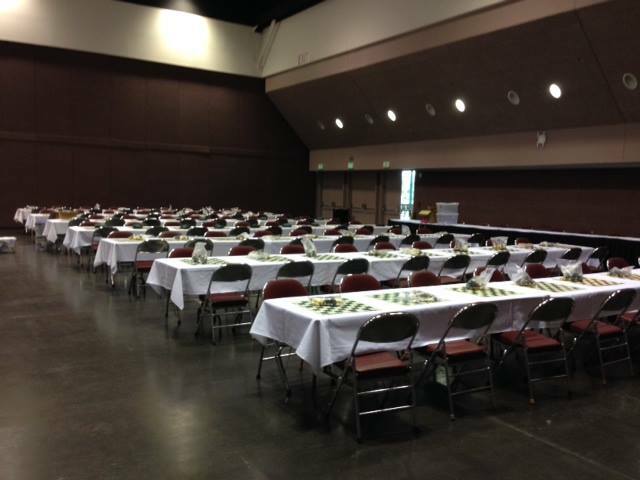 The K-5 Championship section is the second highest elementary school section at the State Scholastic Chess Championships. This section was created in 2007 to give elementary schools without a grade 6 a fair chance to win a championship section. MSJE has won this section every year since it was created. Both MSJE and Weibel entered strong teams in the K5 Championship section. The MSJE team was headed by Rishith Susarla (rated 1956) the top player in the section. The Weibel team was headed by Oliver Wu (rated 1846) the second highest rated player in the section. Many observers expected these two stars to meet in one of the final rounds and determine the individual and possibly the team championship. 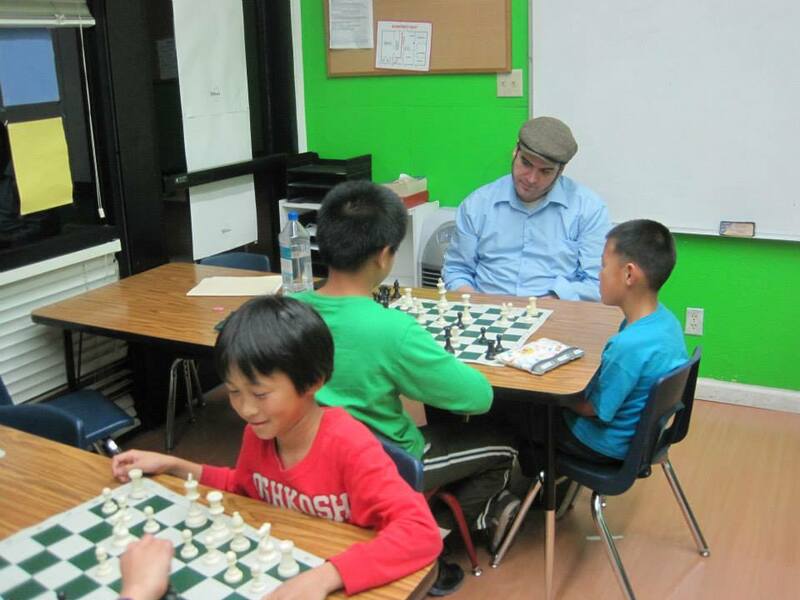 However, in the second round Ryan Dong (rated 1228) of Chadbourne Elementary School beat Oliver Wu. This was a major upset and left the MSJE team ahead. Rishith continued winning all his games and was paired with Chenyi Zhao (rated 1818) in the last round. Rishith needed only a draw to secure the first place, but the Weibel team was only one point behind and Rishith needed a win to maximize the chances of the MSJE team winning. 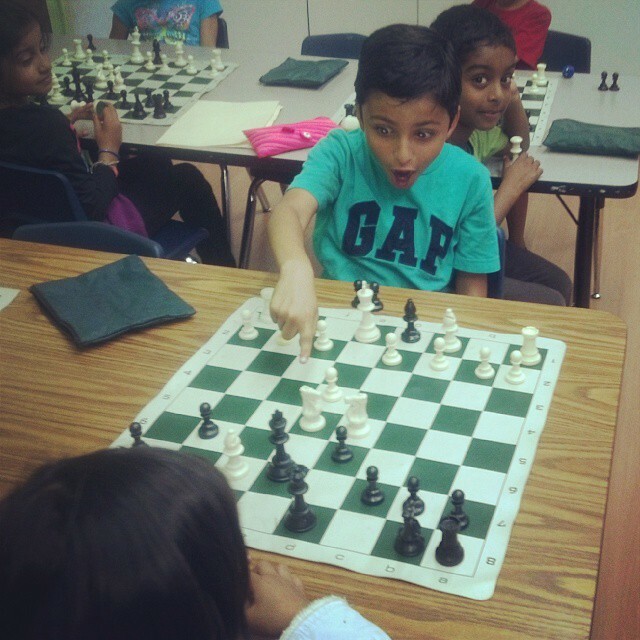 Rishith won his game with Chenyi and MSJE won a comfortable 19.0 to 17.5 victory in the K-5 Championship section. The scoring players for the MSJE Championship K-5 team were Rishith Susarla, 6.0, Leo Jiang and Edwin Thomas, 4.5, Kavya Sasikumar, 4.0. 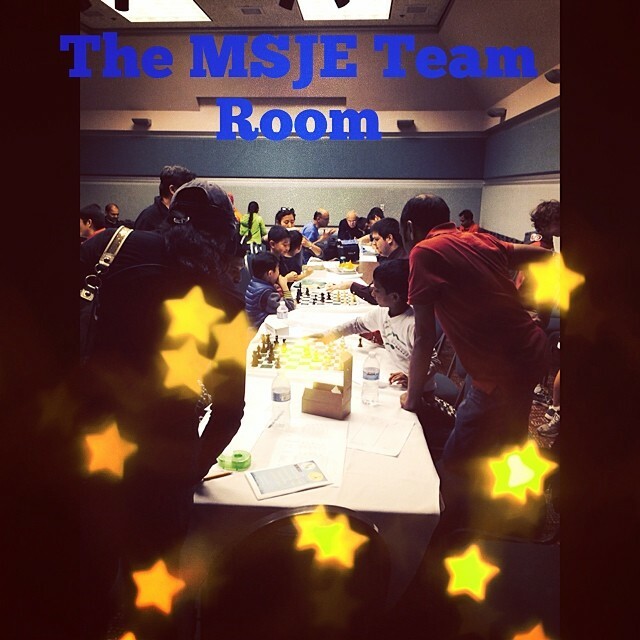 Jaisuraj Kaleeswaran, Jeffrey Liu, Atul Thirumalai Sandeep Salwan, Edison Zhang, Jonathan Zhang and Shree Jay also competed for the MSJE K-5 team. The 2015 K-3 State Championship Team from MSJE. MSJE also did very well in the other sections. The 1-3 unrated section is for players that have never played in a tournament before. 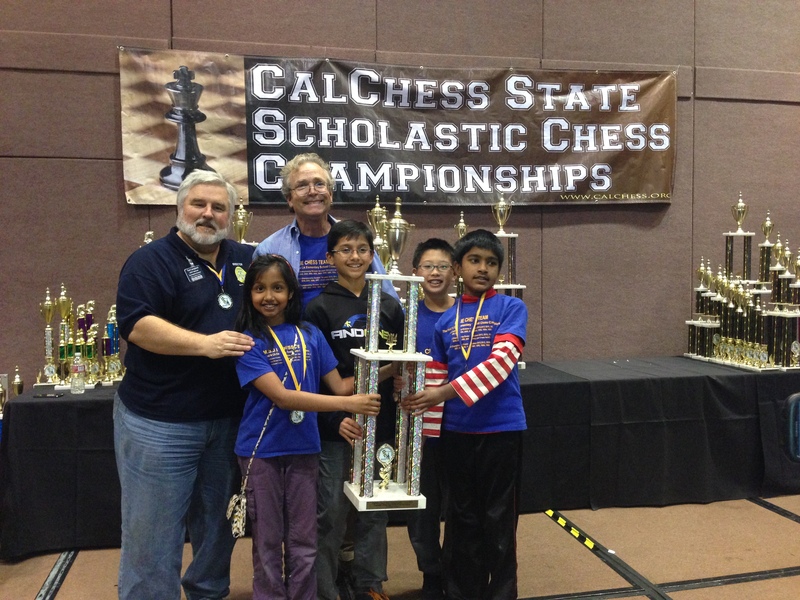 Dhrish Karangula, Adit Mital, Aditya Sujay, and Adarsh Swarmy competed in this section. The team won the first place team trophy and Dhrish scored a perfect five wins in five games, tied for first place in the section, and won a large trophy. Ekasha Sikka and Jason Liu (Pre K brother of Jolene and Jason Liu) competed in the kindergarten division. Both players won trophies. Jason won four of five games and tied for third place. Vaibhav Wudaru, Monish Jonnadula, Ayaan Kassamali, and Siddharth Arutla competed in the 1-3 Junior Varsity division. Eight teams competed in this section. The MSJE team won the second place team trophy. Carolyn McNay, Joshua Diao, Diya Sen, and Gursachi Sikka competed in the 4-6 Junior varsity division. Fifteen teams competed in this section. The MSJE team won the fifth place team trophy. A group hug for the head coach. 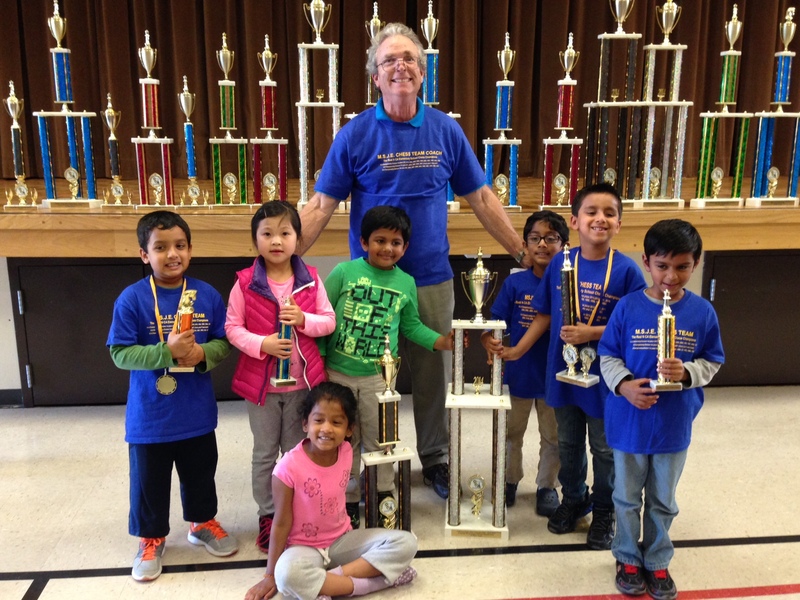 Congratulations to the chess team for a clean sweep of all Championship sections at the Northern CA Scholastic Chess Championships. 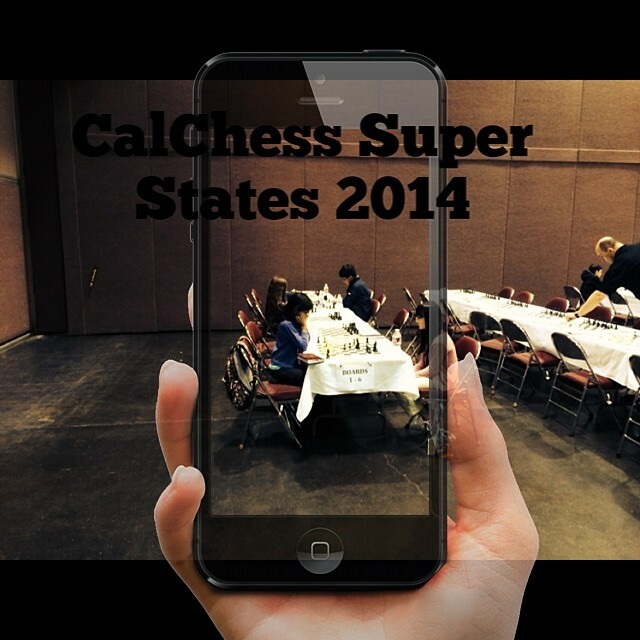 The Calchess Super States(Calchess Scholastic State Championships) is occurring this weekend at the Santa Clara Convention Center. For most, it will be an occasion for games to be won, rivalries to be rekindled and large trophies to be distributed. 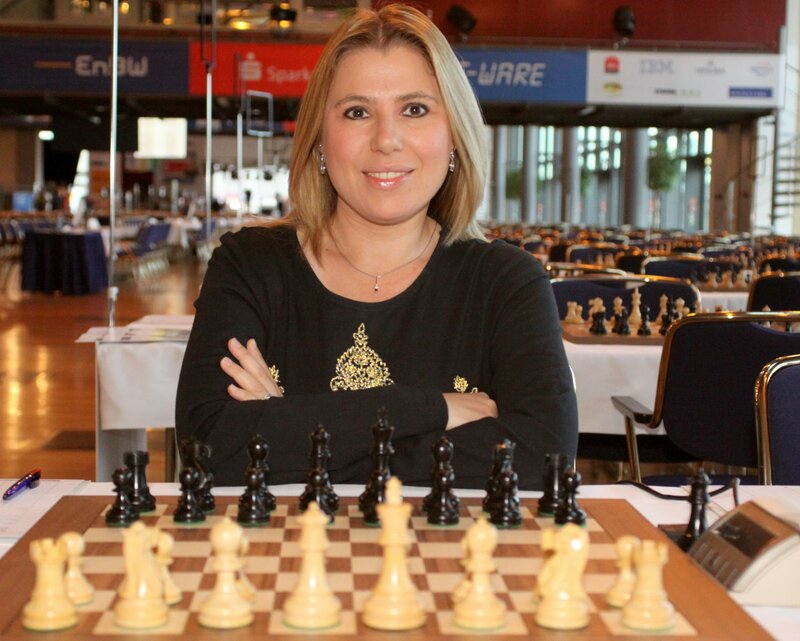 For myself, weekends like these are all about celebrating chess and teaching hundreds of young bright minds. 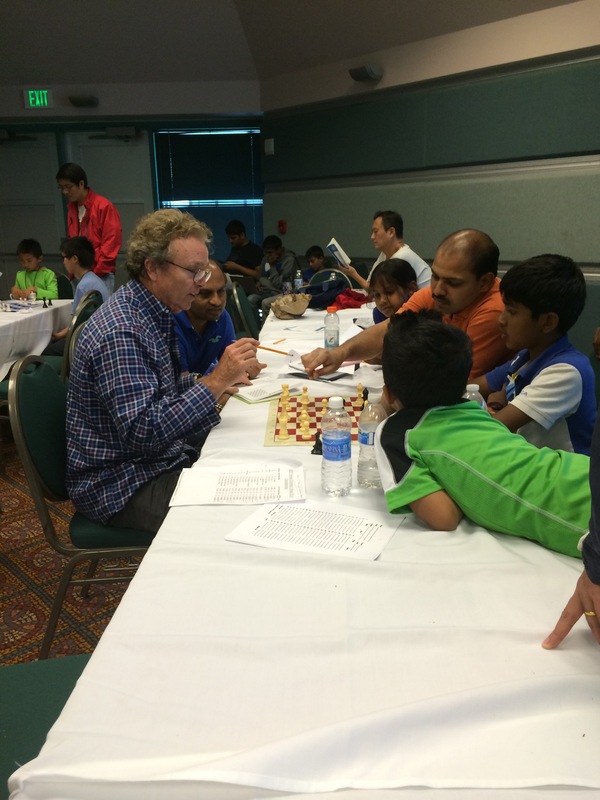 Michael (fpawn) Aigner analyzing a chess game with Rishith Susarla. MSJE Head Coach Joe Lonsdale thoroughly entertaining his students and their parents. TCAMA Director of Instruction James Paquette doing what he does best. Teaching! And then there was me helping out where I could.